Fund-raising for the Serrai di Sottoguda recovery project is already well under way, thanks to the many schemes for spreading the message around the area. Sometimes, in a literal sense… Indeed, a Dolomiti Bus has been driving around for some weeks now, promoting the crowdfunding effort to restore the route through the gorge under Mount Marmolada, devastated by storm Vaia on October 29th. “Let’s take care of our planet”. This is the message that the Dolomiti Bus company, in collaboration of EvoBus, has chosen to advocate; displaying it on the sides of 10 coaches which travel around the Belluno area and to other parts of Italy and abroad. The graphic content was designed with the help of the Province of Belluno, the UNESCO Dolomites Foundation, the Cortina 2021 Foundation, the Municipality of Auronzo di Cadore, the Municipalities of Belluno and Feltre, and the Alto and Medio Agordino Mountain Union. It’s a single message, but with many facets. These range from the promotion of major events such as the 2021 World Ski Championships (which have made sustainability a main focus), to the enhancement of the Dolomite region as a whole, to the pursuit of specific objectives, such as that chosen by the UNESCO Dolomites Foundation. This objective is totally in keeping with the essential spirit of the initiative, which is to confront global environmental challenges. The reconstruction of the Serrai Gorge will involve an Ideas for Action competition, which will favour the project that best combines sustainability, disabled access, and adaptation to a changing climate, which could well result in more events like those of October 29. 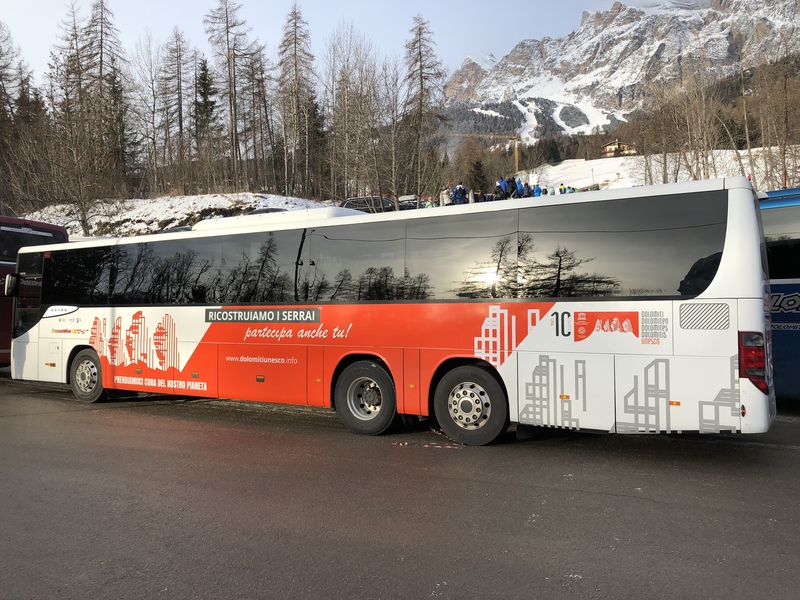 The UNESCO Dolomites Foundation and Dolomiti Bus have worked together for many years, and the company has also become a supporter of the Foundation. The Belluno transport business actively promotes sustainable mobility. This commitment was demonstrated last spring, when they commissioned 30 vehicles compliant with the Euro 6 standard, and also by the Dolomiti TrainBus project, which encourages cycle use in the local area.